One show, two fighters and a whole lot of shots fired. Adam and T-Rexx (Yes, he’s back!) 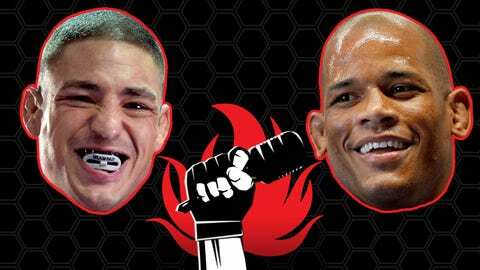 are closing out 2013 in style with two of the toughest guys in the UFC. First, lightweight Diego Sanchez, discusses how breakdancing has helped his fight training and how the "Nightmare" became the "Dream". Then, he puts his attention on Conor McGregor and why the Irish fighter should be put in his place. If that wasn’t enough, Diego calls out Nate Diaz and why the younger brother of Nick is using the UFC ranking system to avoid fighting him. Finally, UFC welterweight Hector Lombard brings his unique story telling ability by sharing his run-ins with Josh Barnett at the gym. Then, Hector brings the heat by saying how he would "beat him up in a real fight". Every week, comedian and longtime MMA aficionados Adam Hunter and T-Rexx take a look at the lighter side of life and mixed martial arts. They aren’t journalists, they are comedians and fight fans with insider knowledge of the toughest sport in the world. This podcast is more than just a breakdown fights, it dives into what fans really want to know with the athletes who put it all on the line.